A smokey haze moved across the St. John Valley near Fort Kent, as reports of a forest fire in Quebec began to surface on Monday afternoon around 2 p.m.
More than 200 firefighters from across Canada and the northeastern United States have been sent to Quebec this month to help fight multiple forest fires fueled by lightning strikes and dry weather. 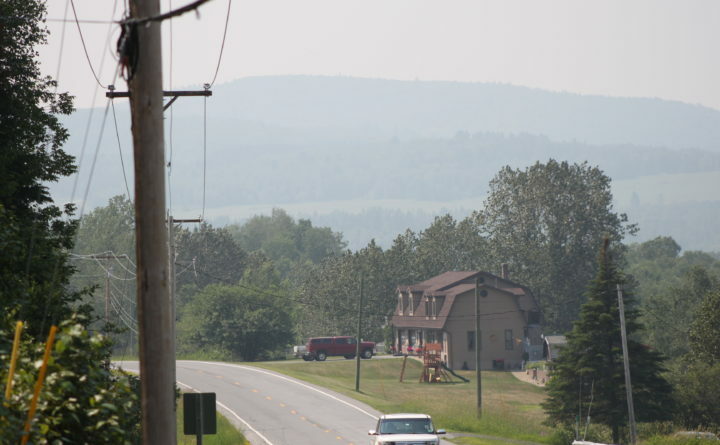 Despite the distance from the fires, a haze can be seen from the St. John Valley on the Maine side of the Canadian border, and concerned residents were calling the Fort Kent Police Department Monday afternoon about the hazy conditions and smell of smoke. Fort Kent Fire Chief Ed Endee said his department is keeping tabs on the Quebec fires, which he said are far enough away that they pose no major risk to the St. John Valley. A map on the website for the Society for the Protection Against Forests Fires in Quebec shows that the closest major fire to the St. John Valley is more than 100 miles away on the other side of the St. Lawrence River. The scent traveled as far as Caribou, 45 miles away, where police chief Michael Gahagan said Tuesday that about half a dozen residents had called in the day before to report smelling something burning in the area. The chief added that there were no fires in Caribou Monday. That smoke can be problematic for some people, according to Endee. The Maine Forest Service Ashland office confirmed Monday that no wildfires were burning in Maine. Meanwhile, reinforcements from Saskatchewan, Alberta, Massachusetts and Parks Canada were on their way Sunday to join more than 400 firefighters from Quebec’s forest fire protection service as well as another 200 or so who already have responded from New Brunswick, Newfoundland and Labrador, Maine and New Hampshire, according to AM radio station CJAD of Montreal. About 60 fires were burning over the weekend, according to officials with the provincial fire protection service. By Tuesday morning, the count was down to 35 active fires in Quebec, according to the Society for the Protection Against Forests Fires. Isabelle Gariépy of the society told CJAD that 357 fires have been recorded in the province since the beginning of the summer season, compared to an average of 276 fires for the same period over the past 10 years. Fires sparked by lightning can smolder for several days and burn deep in the ground, hampering the firefighters efforts to put them out. Quebec is a signatory to the Canadian Firefighters Mutual Aid Agreement and the Northeastern States Pact on Forest Fire Protection, which allows it to borrow these resources when its own overwhelmed. Writers Jessica Potila of the Fiddlehead Focus and Christopher Bouchard of the Aroostook Republican contributed to this report.